How do you explain those flight time ? So what is the actual distance between the 3 points on the map? You are not the first to ask such questions and you are not the last. How can the distances/flight times/travel times/shipping times/cartography on the wiki map be possible when they don't match the distances/flight times/travel times/shipping times/modern cartography. -Because the angles of a triangle drawn between three flight paths = 180 degrees the earth is flat. 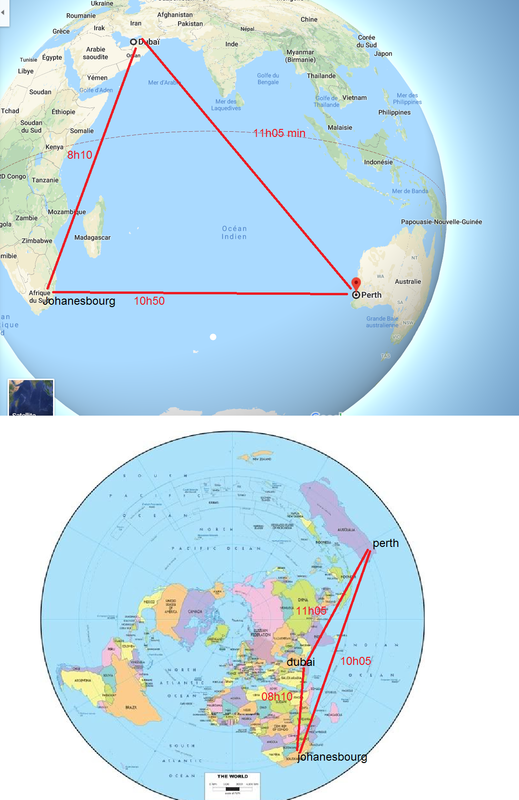 -Because the angles of a triangle drawn between three flight paths = 179.99984 degrees the earth is slightly concave. -GPS systems are based on a round earth therefore will give measurements/distances which support a round earth. -Aircraft are using instruments which assume round earth coordinates which will support a round earth. -There is no flat earth map. -The difference in flight time is based off of flight speed which has yet to be proven. -there are no flat earth flight programs, systems, GPS etc because the flat earth aircraft navigation fund is nonexistent. -there are almost an infinite number of continental configurations (If a flight disproves flat earth continental configuration 23985729387592873 you then need to test continental configuration 23985729387592874).